The Coastview Vineyard's setting could only be described as awe inspiring, And the wines..well judge for yourself! The directive was to create a wine label that spoke to adventure and the idea of hidden treasure, in a Jules Verne style of thinking. Each label references a journey or traveler and speaks to the uniqueness not only of the wine but the vineyard where it was grown. We look forward to sharing our journey as we present our award winning wines to you in our New Tasting Room. it is a matter of necessity. Our mission is to faithfully translate the unique character inherent in the Coastview Vineyard. Its limestone and granite soils, 2200 ft. elevation and terraced hillsides yield wine of exceptional character and interest. Our viticultural practices are guided by needs of the vineyard to get the balance of fruit, flavor and a sense of the terroir. The steep hillsides and low vigor soils help naturally balance the vine and create wines of concentration and uncommon interest. The winemaking practices are a combination of classic Bordelaise and Burgundian techniques combined with all the advances in modern enology for consistently high quality and vineyard expression. We use the very best tools, barrels and knowledge available to honor this amazing site. Great vineyards are the beginning of every great wine, and we are beginning to bring this great vineyard to the world. The Vineyard is a dramatic site that offers a panorama of surrounding mountains, valleys and coastline. 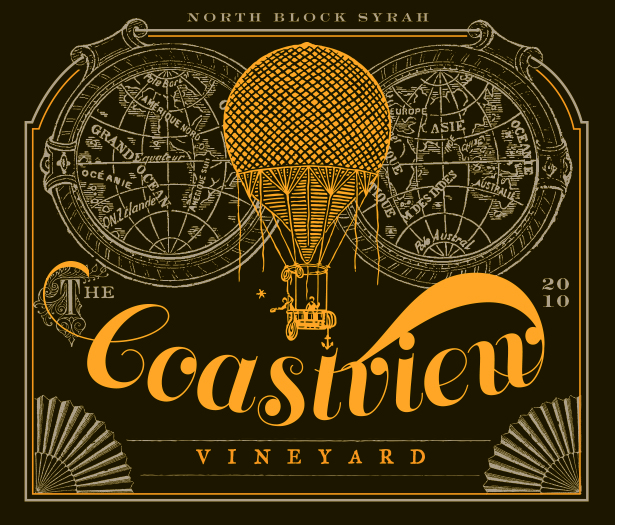 The Coastview Vineyard is located in the Gabilan Mountains on the east side of the Salinas Valley, on an exposed ridge top between 2200 and 2400 feet of elevation. Just under 30 acres of this convoluted 2600 acre property are under vine with plantings of Syrah, Chardonnay, Pinot Noir, and Cinq Cepage of Bordeaux varietals. It is a testament to the vineyard that it can ripen such different varietals in a consistent and exceptional manner. The Vineyard is a dramatic site that offers a panorama of surrounding mountains, valleys and coastline. We farm this vineyard with a focus on sustainability and low impact to maximize its ability to express terroir. Pygmy Sheep graze the native grasses in and around the Vineyard. Water to sustain the vines through the dry summer months is sequestered from artesian springs in lined ponds. The Vineyard soils are shallow and low vigor with layers of decomposed granite, substantial limestone component and thin top soils. The cooling breeze blowing in off the Monterey Bay moderates the warm days with cool night temperatures. This exposed ridge top vineyard has in abundant, unencumbered sunlight, driving even and consistent ripening. The warm days and cool nights allow for long hang times that result in perfect conditions for ripe fruit flavors and elegant acidity.